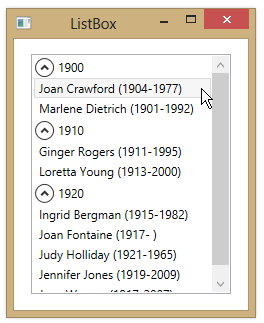 You can group items in a ListBox using a CollectionViewSource. 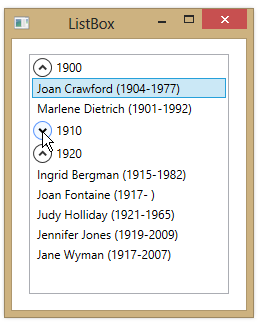 You can then set the GroupStyle property of the ListBox to be an Expander control so that the groups can be expanded and collapsed. In the example below, we group a collection of Actors by the decade of their birth. <ListBox Name="lbActors" Margin="15" Width="200" Height="240"
We can now expand and collapse the groups representing an actor’s birth decade. do you possibly know how to sort/order those groups that are being generated? I know how to order elements insideof them etc. but I want to reorder whole groups. I feel like I have no control of them after they appear. I try to stick to MVVM approach. Forgot to mention, I use .NET 4.0.